No Stars for Talent, hm. @Rough: Late answer too, sorry. Well, you had to listen to it for a loooong time ;). Aren't the logos part of a large-scale charset? I remember seeing the whole set used in one of Raistlin's demos, but can't remember who drew it... unless the grafix was expanded to display more letters than those shown in this cool intro. @sim: late answer... yes, I can't stand this tune, it's so annoying. i just love this intro. awesome music by JCH called "HOLLOW" . 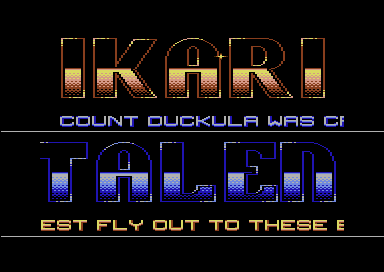 IKARI is simply the best cracking group in the c64 scene. its funny to think that 20 years ago it was so excitement'n'cool scene . we will never forget your great intros. simply the best ! thumbs up. Bod/Talent: I suppose so. Bod, I am interested in all the funny stories from the Ikari/+Talent times, if you do not mind to put them down/share. Is there any way to contact you with this subject? From "Hollow" by JCH to the slick graphics, flawless design and "cracked on Friday the 13th - unlucky for some but not for us", this intro remains a cherished masterpiece of an entire generation, a legacy of the best cracking group on the C=64. Sim, thats correct. There were talks of a co-op between Ikari & Talent and the weekend of that PCS show when Ironlord fell in our laps & we were all together in the UK we decided to start the co-op. Good times..
Yeah, remember this one too from the Game Ironlord. Brings back Memorys to my Head, nowdays we got Family,Work and Stress ^^ Men this Sux ... .. .
Wich i can build up a Timemachine. Bod: acquired, hemm?.. ;). AfaIr, the very same day you decided to found the coop. This was the intro on the very first I+T Release (Ironlord) which was acquired from a PCS Show in London while the Danish Ikari guys were visitting us. That's the Stubby-Noter music isnt it? Disgusting. Almost a classic one from the best co-op. Visually one of the slickest and simple intros ever made for a co-op! I remember this one as a crackintro added to The Untouchables. Deepest regards to JCH for this cool tune (named Hollow+). Coded by Excell himself.